The predictive ability of presidential campaigns has been thrown out of kilter by a front-runner who can't win two contests in a row and challengers who can't win more than one on a weekly basis. Michigan didn't clarify anything. Reading meaning from Michigan is like trying to divine a source from the dust storm ejected by a Shop-Vac while politely pretending that nobody brought a device that farts anything. 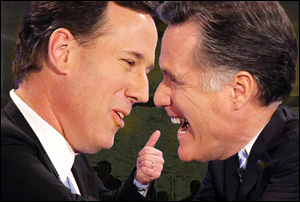 Click on the Mitt & Rick cuddlebears to be taken to the Gawker article. Thanks again to Jim Cooke for the excellent image you can see in whole by clicking the above.